While the rest of Europe is suffering the effects Siberian weather, we in Ireland are enjoying the advantages of the Gulf Stream and its moderating influence on our weather. A little snow fell on high ground, the Wicklow Mountains got a light covering which we can see from where we are, about 20 miles to the west. The only snow we have, so far, are snowdrops. The crop this year is not as good as last year, the mild winter has got them all upset. There were even daffodils in bloom before they arrived, that must have been a shock for them, the daffodils normally bloom about a month after the first snowdrops appear. By the way, to replant or break up very large clumps of snowdrops, wait for the flowers to die back and lift them while the leaves are still green. I’ve done this a few times when the clumps get so large they begin to die in the centres. Now there are snowdrops everywhere, a heartwarming sight. Daffodils are transplanted in late summer as bulbs. They also suffer from overcrowding so I mark these places with coloured pegs, as by next Autumn there will be no trace of where they are. Enough of horticulture, this painting has Viridian Green in its mixes. The colours were: Burnt Sienna & Raw Umber (red), Raw Sienna (yellow) and French Ultramarine (blue). Viridian Green, and black and white. For the damp shady places, beloved by snowdrops, I needed a deep green. The snowdrops themselves are a deep silvery green. If I found a blue and yellow to produce this green I would have to have these colours in all other parts of the painting to maintain colour harmony and this might create more problems than I want. So I use Viridian, which I hate, and deal with its overbearing attitude and unnatural colour. I also added Viridian into the sky, in the blue and the dark clouds, again in the interests of colour harmony. I always add red to Viridian, in this case Burnt Sienna, to naturalise the colour. This can have the effect of deadening the colour after further mixes of other colours, I had to be careful. To counteract any loss of colour intensity I added a little Stand Linseed Oil to the medium, which of late, has been Liquin alone. One thing I confirmed by this, is how Liquin makes painting a lot easier. The oil is ‘slushy’ and slides around quite a bit. Liquin spreads rapidly and if brushed briskly will become tacky, if brushed gently it stays liquid and if allowed to stand also becomes tacky. Great stuff, but check this post if you are, or are intending to use it. The painting took about 2 hours to complete. This is a little longer than normal, I don’t know why. The extra hour makes the task of editing the video a time consuming business so I will have it in a few days. See you then. 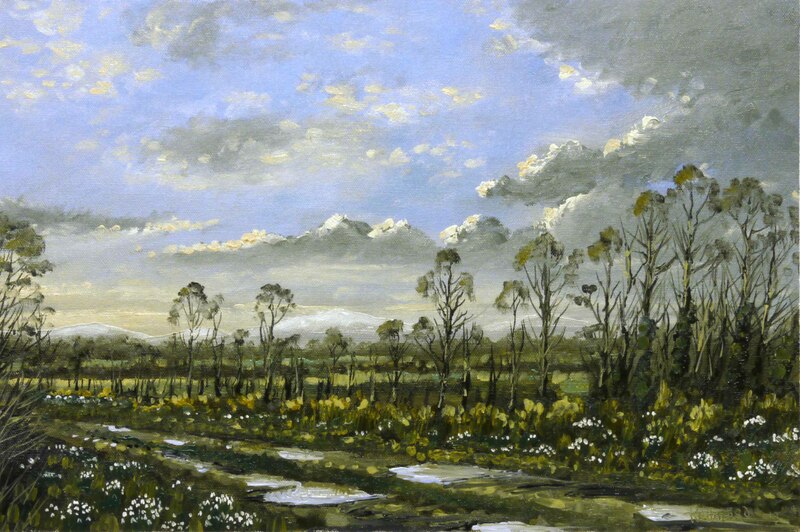 This entry was posted in Oil Painting and tagged Art, Culture, Education, Inspiration, Irish landscape, Oil Painting, Oil Painting Instruction, Oil Painting Landscape, painting, Snowdrops. Bookmark the permalink. Wow this is good i seriously love your paintings! I really love working with Liquin, too – and for a long while I haven’t. May give it a whirl again! Love this painting – thanks for sharing your work! It is always so interesting when a fellow artist shares his process and you also name the colors, you’re the best! beautiful, lovely painting. Your words teach me alot when i have the time to read. I am new to oils so i am learning alot. This is a great painting. I am jealous that it only took two hours….it would have taken me two months! Thank you, but it is a small painting. Delightful, and very bucolic indeed. A little Constable, a little Dutch sky, and oh, my! A very inviting prospect.